The Trump Administration released final rules in mid-June on Association Health Plans with final rules on short-term, limited-duration insurance plans (STIs) due in September. There’s been a lot of ink spilled on those topics and what they may do to either undercut the ACA or provide employers and employees with more coverage options, depending on where you sit in the political debate. These acronyms are a distraction. The order we should keep our eyes on is the third part of the order, the one on health reimbursement arrangements, or HRAs. At the end of 2016, as one of his final acts as President, Barack Obama signed into law the “21st Century Cures Act.” Within that broad-based bill was a stipulation overturning previous IRS guidance on HRA use, which essentially allowed small business owners (50 or fewer employees) to give their employees money to shop for individual health coverage — and potentially ACA-subsidized coverage. This move was significant for two reasons. First, it encouraged employers to give employees a lump-sum to then shop for their own coverage rather than selecting employer-sponsored, payroll-deducted coverage. 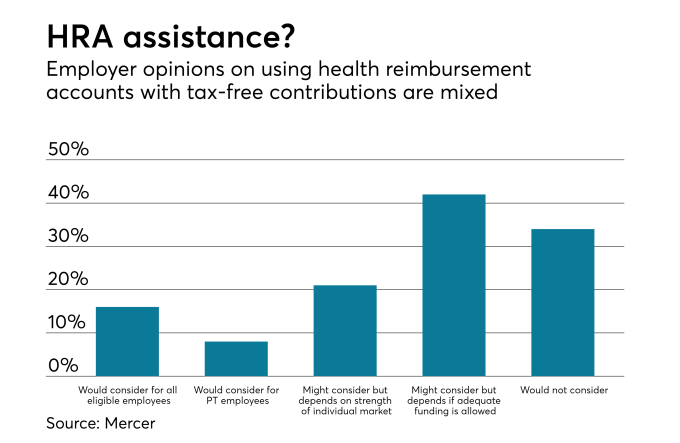 Second, it allowed for HRAs to be the vehicle for this contribution, thereby enabling employers to maintain tax preference without the added administrative burdens of offering employer-sponsored health insurance. President Trump wants to allow for HRAs to be used for non-group coverage to employers of all sizes, not just small employers. If regulatory language makes the same approach for small businesses available to businesses of any size, broker and consultants should view this as an industry-redefining disruption. Over the past decade, there was much speculation — and some very large corporate bets made — on the shift from defined-benefit to defined-contribution for employer healthcare benefits. In this scenario, rising costs combined with increased need for healthcare consumerism would lead employers to shift employees to HDHPs en masse and give them both a defined contribution through an HRA and/or non-HRA funds to shop for benefits on a private exchange, as well as an HSA contribution. Such arrangements were highly marketed but few companies took to them because they rightly saw it as just another thing they would have to manage. They were being asked to make it easier and more consumer-friendly for their employees at the expense of making it more burdensome for their administrators. The Trump Administration’s proposed expansion, while not final yet, is different. Never before has there been a vehicle for large employers to send employees to the individual market and maintain the tax advantage of paying for employee health coverage. And never before have employees stood to potentially pay less on the open market than for employer coverage, thanks to ACA subsidies. A number of organizations are now providing a service whereby they handle the monthly billing on behalf of their employer customers. The core of this service is not to find benefits for customers but to ensure that employees have the funds to pay their monthly premiums on their individual coverage, and they make sure that employers get back any funds not used by employees over the course of the plan year. It’s a huge decline in administration required by employers while taking care of an onerous part of the process for individual. When you compare that to other brokerages’ message of digging in and expending more effort to control your healthcare costs, it would seem that the former would be far more favorable to the latter. Indeed, some benefit companies seem to be specializing in administering this arrangement for startups and other relatively young companies — which likely don’t have an established broker/consultant relationship and hence a different perspective on the relative pros and cons of offering employer-based insurance. Should you be concerned? If you’re unwilling to evolve your business model, then yes. It’s unlikely that HRAs will take over the entire market, just as some companies (and especially public institutions) still offer pensions for retirement. But just like the shift to self-insured has taken hold among a set of activist broker/advisors, a defined-contribution movement could spur a shift in focus from activist program management to administrative efficiency of a different kind, which doesn’t put up a wall between private and public coverage options and hence makes a much less labor-intensive option possible. But according to the annual Kaiser Family Foundation Survey of Employer-Based Benefits, employer-sponsored coverage for small employers has declined more than 13% since 1999. Large groups have stayed relatively steady at 90-95% penetration. But if costs continue to rise and employers start seeing health insurance crowding out other costs — rather, if the crowding out that has already occurred becomes unsustainable, which numerous industry experts have said is reaching unsustainability — then the shift to real defined contribution will be on.